Sadly, this is my last day as University Chaplain of Lindenwood University. As I depart, I wanted to reach out to you to say goodbye before I go. In doing so, I want to thank you for the blessing it has been to be your chaplain. For those whom I taught, it was a supreme honor to be your professor and for those whom I worked with, it was a joy to be your colleague. I have loved this university since I first set foot on it as a college freshman over 13 years ago and all of you who have made it what it has been will be sorely missed. Though I will no longer be at Lindenwood, my prayers continue to be with you, and it would be a delight to continue to hear how the Lord is working in your lives. 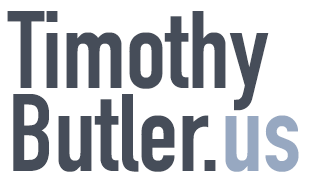 I invite you to stay in touch via Facebook (Timothy R. Butler), Twitter (@trbutler) or e-mail (tbutler@ofb.biz). I too would appreciate your prayers as I seek to discern where God is calling me next. As a conclusion, I have one final video to share, a retrospective of the Chaplain’s Office that was formed as part of my proposal to become Lindenwood’s chaplain and the events God allowed us to start in it. Please join me in rejoicing in what God has done here at Lindenwood. Many of these events included you and I hope you enjoy getting to see how what you served and participated in came together into something beautiful. As I end my time as your chaplain, let me close with these words from Numbers 6:24-26: “The Lord bless you and keep you; the Lord make his face to shine upon you and be gracious to you; the Lord lift up his countenance upon you and give you peace.” May the peace of Christ be with you all. Two years ago, I walked into a strange church and sat down for a Sunday service — the first time in my life I was the “visitor looking for a church.” For many people, that may be a normal enough experience, but as a lifelong member of another church, I felt a bit odd being on the other side of the visitor equation. Two days prior, I had sat in that same church's office, talking with the two pastors about what the church was like. In both settings, as unfamiliar as the church and its people were, it felt welcoming. Something felt right about it. And so it still does. I'm glad to say that church is now my church and those unfamiliar people are now my church family. God had quite a blessing in mind, though I did not know it, on that day two years ago. The first matter complicating the search for the perfect 4G service is that there is not one thing meant by the term 4G. Sprint (along with partner Clear) and Verizon come closest to adhering to the technical standard for 4G with their respective WiMAX and LTE networks. However, most people care more about speed than how that speed is achieved, which led first T-Mobile and then AT&T to start referring to their upgraded 3G networks as 4G as well. TechCrunch: To 4G or Not to 4G? While 4G is indeed meant to refer (in the big picture) to the fourth generation of cellular wireless standards (as the successor to 3G which arrived in the early 2000s, which succeeded 2G in the '90s, etc. ), the answer to this question is complicated by the fact that each carrier seems to be defining 4G in the way that best suits them. Sprint (along with its partner Clear) and Verizon generally get closest to adhering to the technical specification for 4G with WiMAX and LTE, respectively. T-Mobile and AT&T, meanwhile, are stretching the definition to include their upgraded 3G networks, on the (arguably shady) basis that the speeds are faster than traditional 3G networks. To put it simply, there are essentially two meanings to 4G today: the technical one and the common one, the latter referring to cellular Internet technologies that can run at speeds competitive with DSL or cable Internet. Ultimately, that is what people generally want out of a 4G network and so, to some extent, the AT&T and T-Mobile are not that far off in their labeling. So, it seems that there are really two meanings to 4G today: The technical one and the non-technical one. Essentially, the latter refers to cellular networks that offer web-connectivity speeds competitive with DSL or cable. In the end, that's what we want 4G to represent anyway — mobile speeds that are concurrent with our web surfing capabilities at home or in the office — which is why carriers have started using “network updgrade” synonymously with “4G”. Obviously, nothing I wrote was terribly novel, but the parallels between those paragraphs goes way beyond two writers simply talking about the same subject on the same day. I've contacted TechCrunch for comment. I'll update this entry when and if I hear back. Update: I talked with Rip Empson this evening. He apologized and reworked the beginning of his article to provide attribution to Open for Business. I really appreciated the speed at which he handled this. Thanks, Rip. It is amazing to me that I have completed another semester of seminary. Semester six of eight. There is something profound to me about that particular number. I think it was the same way in college. Hitting the three quarters mark symbolizes having made it through not just a simple majority, but really the bulk of things. It is not that suddenly I am getting a false sense of security about seminary. And, as much as it feels good to accomplish things, I find myself of mixed feelings that I am this close to being done. But, in any case, in another year, I will be done with that “project.” It feels like I just started. Actually, thinking back, maybe that's not odd — some conversations around Christmas finals times in college seem like they were just yesterday (Jason Kettinger can read into this if he wishes). I looked up an e-mail conversation I had with a professor in December 2005 tonight and found myself amazed it was that long ago. But, here we are about to enter the second decade of the new millennia. And therein lies another interesting observation. The '10's will be the fourth decade in which I have been present for at least a portion. Time's winged chariot flaps rapidly forward. Here's a fun little meme that I was tagged on via Facebook. Answer these 30 Things No One Would Think To Ask. Then tag me so I can come and have a look. After that, tag friends who you'd like to answer these questions. Feel free to answer below or otherwise comment on where you answered the questions. I don't think so. I've only been on one or two — I'm a fast learner when it comes to things like establishing I'm not a roller coaster guy. 4. Would you rather sleep with someone else or alone? I'm happy enough to have my cat lay on my bed. Other than that, I'm unmarried, so I'll say alone. Yes, I believe so. I like creative pursuits such as poetry. To the extent hearing about celebrities is unavoidable, Jolie has always bugged me. But, honestly, I think I will decline to comment. Yes. McCain would have been a better president than Obama. Huckabee would have been a better president than either of them. I'd be a better president than all three of 'em. Probably at some point I did. I forget how to play card games if I don't play them frequently. Of recent commercials, “Clay.” Otherwise, I'm not sure, 1984 is hard to top. A.G. She is still a friend (I saw her last week for the first time in ages, as a matter of fact), and one who might not want to pop up on a Google search in this context, so initials are all you are going to get. Yankees, just because of what the Soxs did to us in 2004. No. Had I, I may not be here today! I probably remember something about them most mornings, but usually only a tidbit or two. The ability to play musical instruments. I like my meat cooked, thank you very much. A t-shirt and pajama bottoms. Tuna. Blue Cheese. Anything made of brains. Probably at some point. I try not to. Yes and I'd tie that in with number 5. So, I was thinking I ought to take down the snow from this esteemed blog, but I may leave it up just a tad longer. This week has been a delightful showcase of what is to come for the spring with warm weather (warm enough for shorts!) and buds starting to appear on trees. But, this weekend the snow is suppose to return, so the blog snow remains somewhat appropriate. It is still winter, after all. I'm not quite sure what I like better, the beauty of a fresh fallen snow (when I have no place to go) or spring with its flowers and trees. I think I am ready for spring, but I am really in no hurry. Every season has its glories!